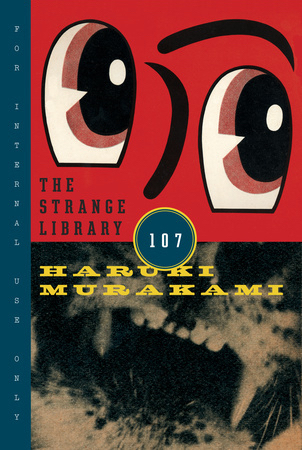 While I have read a great deal about Haruki Murakami and his works over the years, it has turned out that The Strange Library is his first book that I have actually read. A fairy tale, basically. And a wonderful one, full of mysterious moments, colorful characters and surrealism. I found myself thinking of Baba Yaga and Borges and super-streamlined Stephen King and, either oddly or appropriately, The Curious Incident of the Dog in the Night-Time. I'm sure there is Japanese folklore and symbolism soaked into the tale, but I also like the idea of leaving some of the tale mysterious and open to endless interpretation. Highly recommended. Will only take 30-40 minutes to read, with some time to examine the amazing illustrations, too. But perhaps not to be read while sitting in a public library at dusk. Full disclosure: I *missed* the last page, set in a smaller font and easily missed, like a dry end note, on a my first read-through. I only became aware of it by reading another online review that referenced it. So I scrambled back and checked it out. For me, it doesn't change my five-star rating or my review. It certainly lends the tale a darker feel. ... My take: Maybe some readers are supposed to miss the final page and have the tale end, for them, where it does. Nobody gets to choose who does or doesn't get to the final page, but it's there for readers to do with (or not do with) as they please. Now I need to figure out where to go from here, with regards to Murakami's other works. I'm not going to jump from this into one of his opus-sized works; I just have too many other books on the to-read list at the moment. So I'm thinking, perhaps, South of the Border, West of the Sun or The Elephant Vanishes (a collection of his early short stories). Any thoughts or suggestions?